We do a lot of antique and vintage store browsing, and every now and then I run across a piece of Lettuce Ware and comment on what a darling addition it would make to a spring table. But alas, we have a small kitchen that comfortably fits our one set of everyday dishes with little room to spare, and a buffet already filled up with two additional sets of family heirloom dishes. But speaking of Lettuce Ware, I was so excited to hear of Tory Burch's new collaboration with Dodie Thayer. I just love the story behind the collaboration. Dodie Thayer taught herself to mold pottery from cabbage and lettuce leaves, capturing the elegant 1960's spirit of her native Palm Beach, Florida. With famous collectors like C.Z. 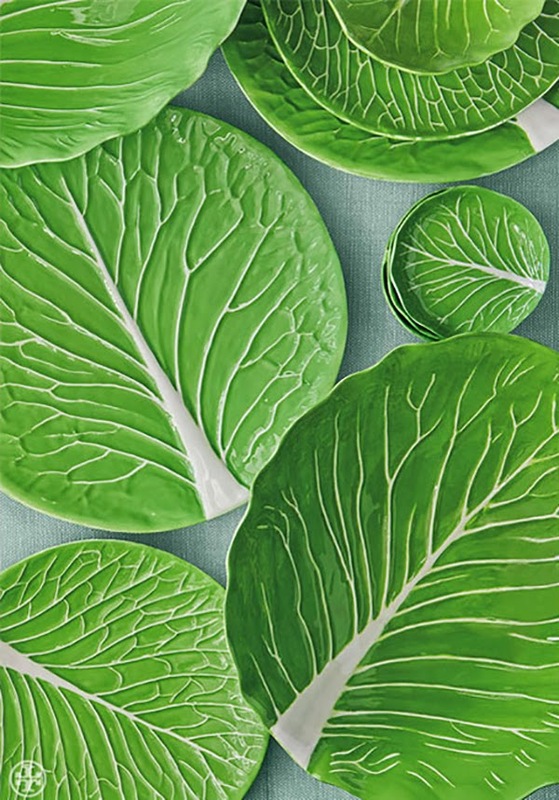 Guest, the Duchess of Windsor, and Jackie Kennedy Onassis, there's no denying Lettuce Ware's enduring chicness. (Who wouldn't want to be included in that group?) Tory Burch personally called Ms. Thayer to suggest a collaboration, and I'm sure that so many are glad she enthusiastically agreed. Tory is another woman who brings a sense of chicness to everything she touches, reinterpreting classics for a new generation-- I so enjoy watching the evolution of her brand. 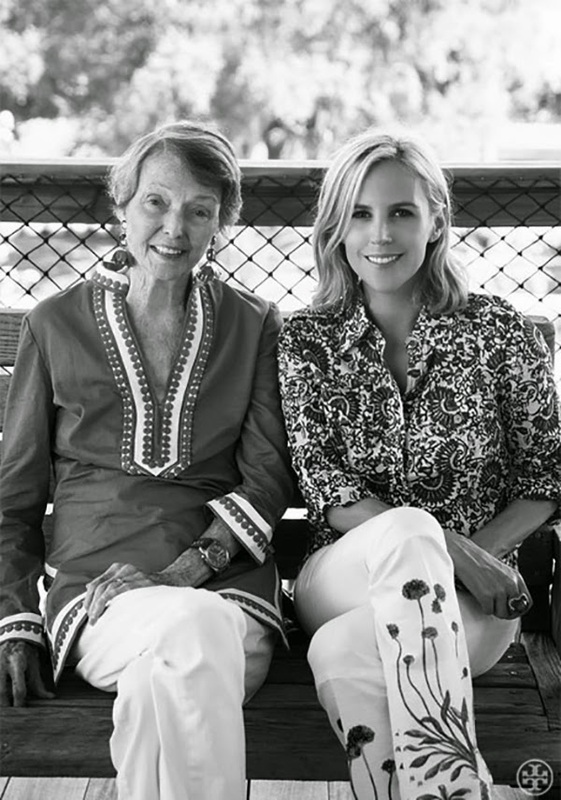 From what I've read, original Dodie Thayer designs get snatched up at auctions, so it's wonderful that Tory Burch is making them accessible again. 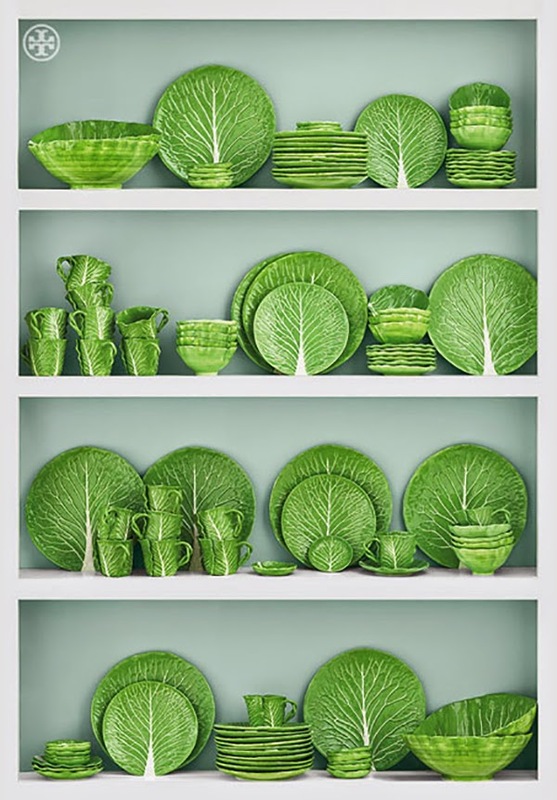 Personally, I don't think I would set a table with a full collection of Lettuce Ware. It feels a little overkill to me, (or maybe it's just my age!) I love the idea of mixing and matching-- maybe a Lettuce Ware salad plate layered over a simple white china or glass dinner plate, or serving Easter dessert or a deviled egg appetizer on one of the canapé plates. The options are endless! I love decorating for Easter, but am just beginning my collection and having fun deciding which direction to go in. For me, Lettuce Ware inspires a vision of a tabletop that is very whimsical Peter Rabbit-- pastel colored alabaster eggs, carrot and bunny rabbit accents, and crisp embroidered linens.